Matt's Hallmark Holiday Hell: "Switched for Christmas"
Published Dec. 15, 2017 at 7:16 p.m.
On Nov. 9, 2017, during an OnMilwaukee editorial meeting, pop culture editor Matt Mueller brought up the craze of Hallmark Christmas movies. It was a decision he would come to immediately regret, as he was quickly forced assigned to watch a new Hallmark movie a week during the holiday season and write about his discoveries and loss of dignity. These are the chronicles of Matt's Hallmark holiday hell. I'll admit that I'm riding a bit of a high after last week's surprisingly surprising showing of "The Christmas Train" (even if Hallmark hasn't responded to my "Joan Cusack: Train Creep" television series pitch). And what better way to keep that high going than a Hallmark holiday movie starring not just one Candace Cameron Bure but TWO Candace Cameron Bures?! And there's even a bonus Bure! IT'S A BLIZZARD OF BURES! A big-city and/or corporate Candace Cameron Bure arrives in a small town in the hopes of organizing the local school's big neighborhood holiday to show her twin sister, Candace Cameron Bure, that her life isn't that bad. In the process, she stumbles into a handsome old school crush turned philanthropist who's fallen out of love with the holidays thanks to he likes Christmas; she's the one frigid about festivities, but also wants to help organize the party as a possible big donor to the school. Will she pull off the party, while also thawing her frozen, Grinch-like heart? And will they find the greatest Christmas gift of all ... love? Hot chocolate, chirpy relationship commentary from a best friend character and adoring looks from Candace Cameron Bure's real-life daughter and "The Voice" contestant, Natasha ensue. I don't know if I've made this clear, but "Switched for Christmas" stars D.J. Tanner herself, Candace Cameron Bure. Hallmark generally loves its "Full House" alums, but it REALLY likes Bure, casting her for their holiday movie season ad bumpers as well and making her impossible to escape on the Hallmark Channel. Co-starring alongside Candace Cameron Bure is D.J. Tanner herself, Candace Cameron Bure. Hallmark generally loves its "Full House" alums, but it REALLY likes Bure, casting her for their holiday movie season ad bumpers as well and making her impossible to escape on the Hallmark Channel. Fun fact: In 1995, Bure (then just Candace Cameron) starred in "Monster Mash," a very real adaptation of the famous Bobby Pickett Halloween song starring Pickett himself as Dr. Frankenstein. I'd make fun of using a novelty song as source material for a feature film, but "The Emoji Movie" exists. The plot synopsis sounds pretty much just like "The Rocky Horror Picture Show" – except this forgotten oddball also comes written and directed by two of the guys behind "Toy Story" and co-stars Milwaukee theater stud Anthony Crivello and "Dancing with the Stars" judge Carrie Ann Inaba! What a weird thing! I'm burying the lede here, though: "Switched for Christmas" also stars HAPPY THE DOG! Happy the Dog (not to be confused for Happy the Dog from "7th Heaven," who is sadly no longer with us) was a rescue pup adopted by the Hallmark Channel and now stars on its show "Love on the Shore." Weirdly, Hallmark also has Happy the Cat, a fellow rescue animal adopted by the channel as its "Ambassador of Paws-itivity." I would watch a "Feud"-like TV mini-series about these two fighting behind the scenes. GET READY FOR ANOTHER PITCH, HALLMARK! I'm sad to report that two Candace Cameron Bures is not greater than one – and after "Switched for Christmas," I'm not convinced one is all that great either. It's an oddly disappointing discovery. Coming off of the surprisingly compelling "Christmas Train" last week, I was intrigued by a more high-concept Hallmark Christmas movie. Sure, duplicating performers wasn't that new of an idea when "The Parent Trap" did it ... the original Hayley Mills version. Plus, production-wise, the Winklevii from "The Social Network" this is not – it's pretty obvious the two are never speaking to each other, and even then, they're only on screen together for a little bit – but it's something. But any Hallmark movie that inches toward some initiative and creativity beyond the usual five plot lines should be commended. Or at least it normally would be commended, but "Switched for Christmas" just fades into a background noise bore, as the homey, Christmas-loving Candace Cameron Bure switches spots with her stiff, all-business sister Candace Cameron Bure. I could call them by their names, but they're not all that interesting of characters, so I shall merely call them Country Cameron Bure and City Cameron Bure. The two think each other's lives are easier, so they trade spots, City Cameron Bure tasked with organizing the school's Christmas party while Country Cameron Bure is tasked with organizing a real estate company's Christmas party. And, of course, the two fall in love along the way. The formula should now lead to zany switched-life hijinks, but "Switched for Christmas" is distressingly light on those. City Cameron Bure can't open a package of bacon! ZAAAANY! There's some amusement with Country's kids immediately noticing City isn't their mom, and by the end, the movie starts having fun with the predictable reveals, throwing mistaken identities and misplaced smooches all over the place. But by then, it's too little too late. The biggest problem is that there's just not enough of a difference between the two leads. Yeah, one's a little stiffer and more dressed up, but otherwise, they're about the same person – both with essentially the same goals too, throwing a strong Christmas party. So it's basically just watching the same story with the same actress, barely seeming all that different from her opposite self, dealing with the same main conflict replayed twice in the same movie – and that actress isn't quite making the most out of the double role. Much like other Hallmark crown jewel Lacey Chabert, I came in expecting something special or at least more interesting than the usual performance, and instead I got bland pleasantness. Not a bad performance, mind, but not one that needs to be duplicated. By the end, the only double trouble was for my attention span. 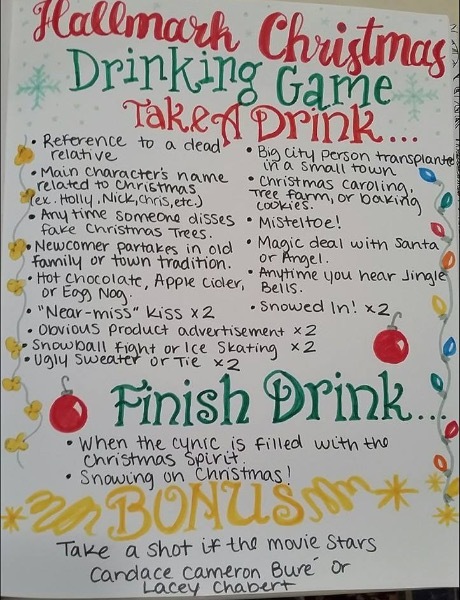 Not that I needed any more excuses to drink heavily while watching Hallmark holiday movies, but thanks to Wide Open Eats, I found this Hallmark drinking game created last winter by human saint Brittany Graves and posted on Facebook. So let's go through the checklist and see how crushed we can get off Christmas cliches! Reference to a dead relative? The twins' mom died, which is very sad – unless you're playing this drinking game, which in that case WOO! DRINK! Christmas-y main character name? One of the Bures is named Chris. DRINK AGAIN! Fake Christmas tree disses? In all my one month of watching Hallmark holiday movies, no one has insulted a fake Christmas tree. If and when it finally does happen, I'm drinking an entire bottle of creme de menthe. CUT THE DRINKING OUT! Newcomer in old-timey tradition? There's a thing called the Lights Walk that City Cameron Bure must prepare for, so RESUME BOOZING! Hot chocolate? Much of the finale's big screwball antics takes place around the hot cocoa corner, so put some marshmallows in your drink of choice and DRIIIIIIIIIINK! Near-miss kiss? Not one. What kind of Hallmark Channel movie is this? I want a refund. SOBER UP! Product placement? For the twins special Christmas brunch, the Bures head to Christopher's Prime Steak House. Then, "Switched for Christmas" begins its big Christmas tree decorating montage of love and sweetness with a big, fat, greasy Balsam Hill logo. Two blatant ads means TWO DRINKS! THANKS CORPORATE AMERICA! Snowball fight or ice skating? For a moment, the ice rink at the school's Christmas party was at risk. Thankfully, however, it's saved – unlike my liver, which has to take another hit because DRI(*hiccup*)NKS! Big city person in small town? No, but the city of choice in "Switched for Christmas" is called Littleton ... which is really close to sounding like "little town"? Does that work? Judges? VERDICT: NO DRINK! Caroling, tree farming or cookie baking? While City Cameron Bure burns some bacon and eggs, no cookies are harmed in the making of this film – nor is there any tree farming or carolers of note. DRINK'S GETTING WARM! Mistletoe? More like mistle-nope! I'm just tipsy enough to think that pun is worth publishing. DRINK IS MOSTLY MELTED ICE CUBE NOW! Magic deal with Santa/angel? I was hoping this would be a "Freaky Friday" situation with a body swap, but then I realized how much extra confusing that would be. And then I remembered that I drank a whole bottle of Bailey's just a few categories ago. So better keep it simple. AND KEEP IT SOBER. Anytime time you hear "Jingle Bells"? Nope, but it does open with a cover of "Baby It's Cold Outside" featuring Avril Lavigne, which was dangerously close to driving me to drink. STILL STONE-COLD SOBER! Snowed in? And we end with a big ol' nope. The movie with a train managed to get snowed in, but this one fails to bring the blizzard? There was even a prime "Bure/buried" pun just waiting to be used. It will have to keep waiting, though – just like your surely watered-to-hell beverage of choice. SO SOBER I'VE GOTTEN DRUNK ON LIFE! The final categories help out a lot in my mission to get Hallmark hammered, as you finish your drink for City Cameron Bure eventually warming up to the holiday spirit thanks to her once-estranged family, finish another drink for the snowfall during the Christmas finale and take a shot – of course – for Candace Cameron Bure. Actually, two shots for two Candace Cameron Bures. And you know what – double all of the drinks. DOUBLE THE BURES, DOUBLE THE LIVER DISEASE!